. :: Ash KF5EYY 3V8SS 3V8SF 3V8BB Website | Home ::. See you in Friedrichshafen 2019 Insh'Allah! 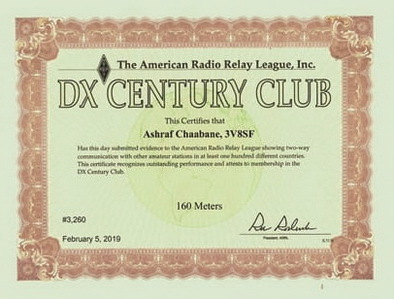 I'm glad to report that I achieved 103 DXCCs on Topband within the past 3 months of operation (An average of 1 night a week). More details in the Topband page. 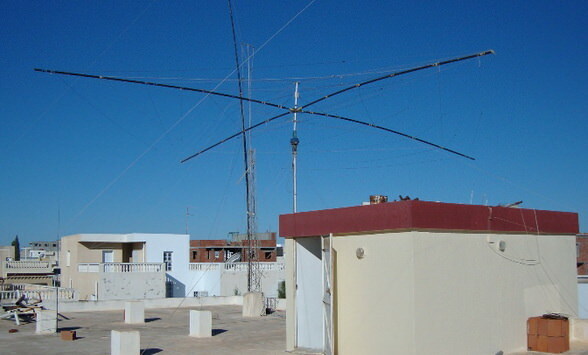 The Association des Radio Amateurs Tunisiens (ARAT) has arranged on October 31st 2018 a visit to the Shortwave Broadcast Station of Tunisia located in Sidi Mansour, Sfax. 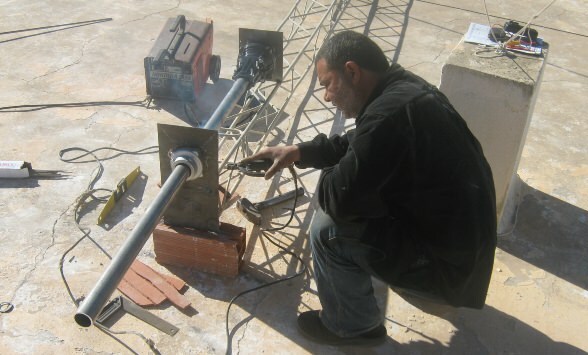 The site also includes 2 verticals for MW broadcast used before for Radio Sfax. The facilities are not currently operational for budget constraint. 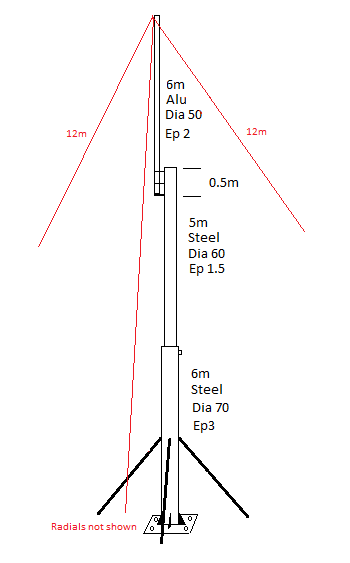 Preparing for the new season, I designed and built a top loaded vertical antenna for 160m in 3V8SF location. 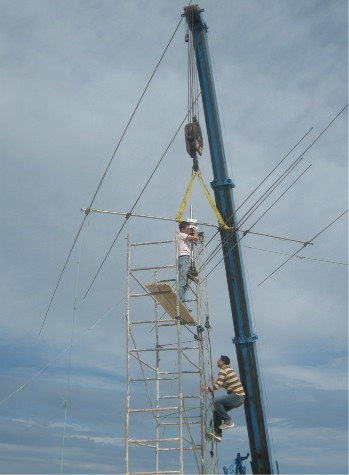 The antenna is 17m high with two top loading wires 12m each. For instance, the antenna has 8 radials, 19m each. A shunt match coil is added at feedpoint. The map above shows the stations I could QSO during the night of September 21st. The antenna performed really well with 100W only. Unfortunately, the beverage antenna was disconnected. More info could be found in Topband page. 3V8SS radio station is now equipped with a Triplexer and 3 Band Pass Filters for 20, 15 and 10m. I bought the set from Low Band Systems by RA6LBS during my visit to HamRadio 2016 in Friedreshchfen, Germany. 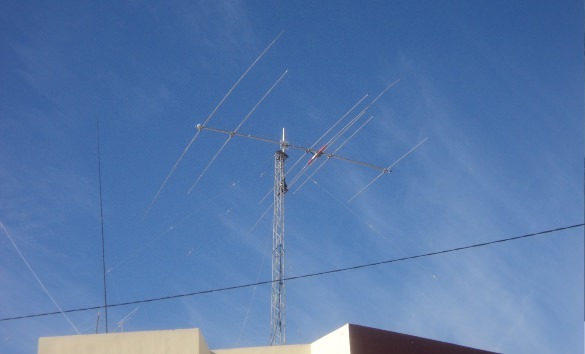 The Triplexer provides 100% redundency of the high bands Yagi (An FB33 from Fritzel recently installed). Felipe's CT1ILT has kindly supported with a 6x2 Switcher. The switcher was wired and boxed by Ahmad 3V/KG5OUE. During my stay in Bali Indonesia for honeymoon, I had the pleasure to meet Made YB9AY in Sanur Area. YB9AY Station is located in Made's house within the fences of his hotel Wirasana Bali. The YB guest license requires showing to ORARI Official your Passport, a valid license (check countries list able to have guest licenses), a passport photo and fees of 150'000 Rupiah (about 10 US$). Click here to see my guest license. Propagation from this part of the world is very different. High bands start opening in late hours of the afternoon. QRN is relatively high. local QSOs can be made on low bands. I made few QSOs on Friday July 24th then decided to operate a little bit in IOTA contest hoping for more activity. I did over 120 SSB QSOs on 15 and 20. Unfortunately, Made didn't have a key or cable for CW. Made YB9AY is a keen 6m operator. He is a former ORARI President and one of the most active radio operators among thousands of other hams in the island. 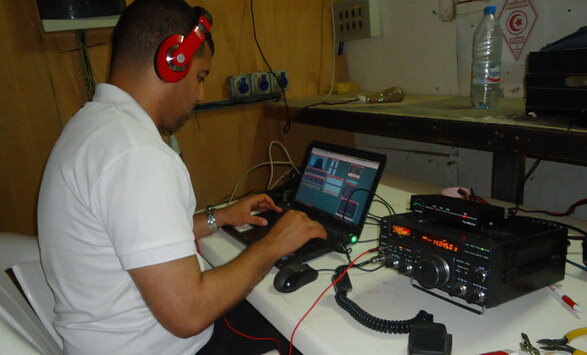 Jim W7EJ kindly invited me to join him in a Multi/Single effort from his station CN2R located in Casablanca Morocco. It didn't took me two days for me to confirm my attendance. 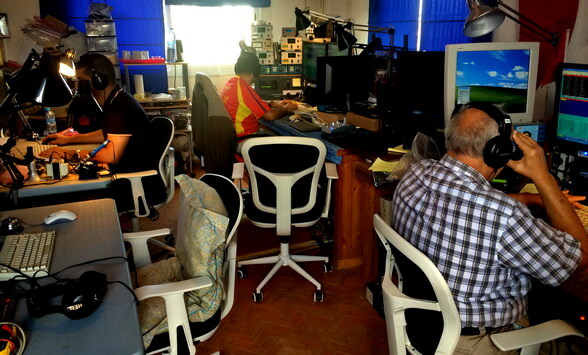 The team was composed of W7EJ, EA8RM, I4UFH, HB9DUR, W7ZR, EA9LZ and myself 3V/KF5EYY. Our plan was to use 1 Run Station and 1 Mult Station. 2 other stations can join the RUN group as in-band stations or as additional MULT station. All the stations were interlocked accordingly. 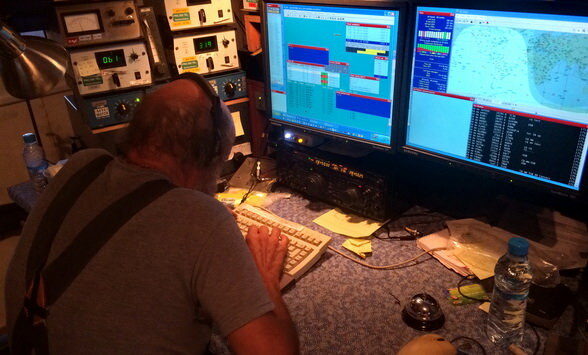 Jim arrived early in October and had to set up two new towers for the MULT/In-Band Stations. 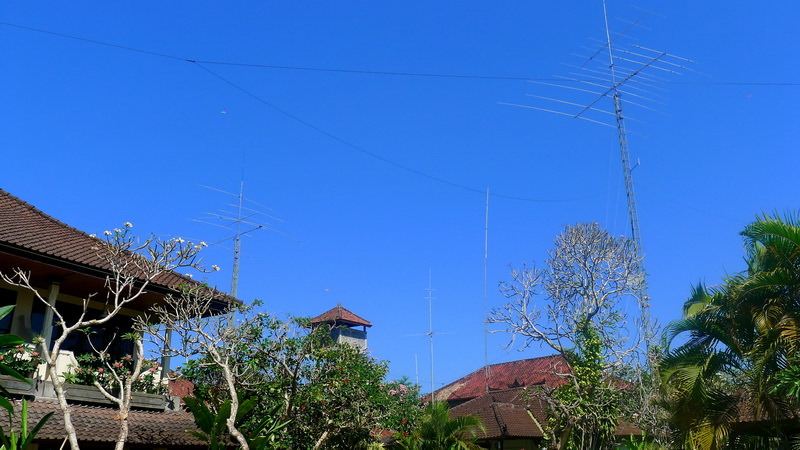 The towers were over 250m away from the shack for the stations to be used within 20kHz from any MULT or RUN station. Rotors are driven through WiFi. Each tower was equipped with an A4S and an inverted-V for 40. The main RUN and MULT stations have three different antennas on each band pointing to different directions with selection possibilities. Contest start wasn't that good but the team could overcome the stress and enjoy. Preparations and fixing didn't finish by contest start, Jim still had to fix some issues with WiFi rotors. The Partner station wasn't unfortunately ready for use. Over 1500 QSOs were made on the In-Band stations. 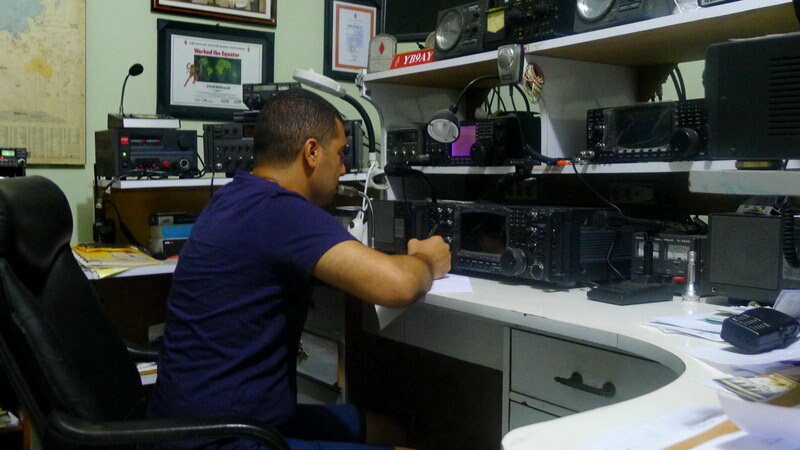 The contest ended up with 9818 QSOs and 25 million points. Thanks to LA7QIA's support, I set up a Reverse Beacon in 3V8SS Radio Station. The set up consists of an SDR-IQ by RF SPACE, CW Skimmer by VE3NEA, W3OA's SkinScan, and a dipole antenna. I sometimes switch it on other antennas as needed. This Skimmer (named "3V/KF5EYY") is the first in North Africa. Appreciate the help of N4ZR, VE3NEA and W2RF. See spots by 3V/KF5EYY Reverse Beacon here. YASME Excellence Award 2013 awarded to KF5EYY! I was nominated in 2013 to be awarded the YASME Excellence Award. Part of the price value went to support ARAT's activities. 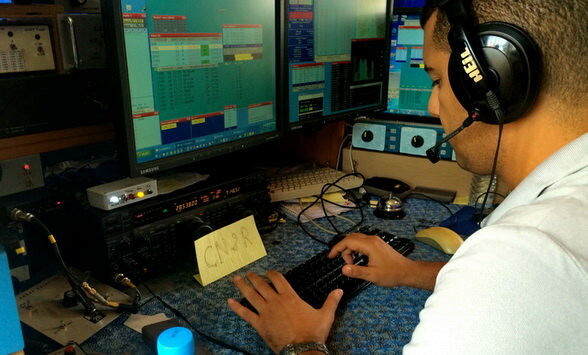 This is what YASME said: "Ashraf Chaabane, 3V/KF5EYY, has become an energetic representative on all fronts of Amateur Radio in Northern Africa and globally, presenting a positive role model for Amateur Radio throughout the Arab world with his enthusiasm and competitive spirit. 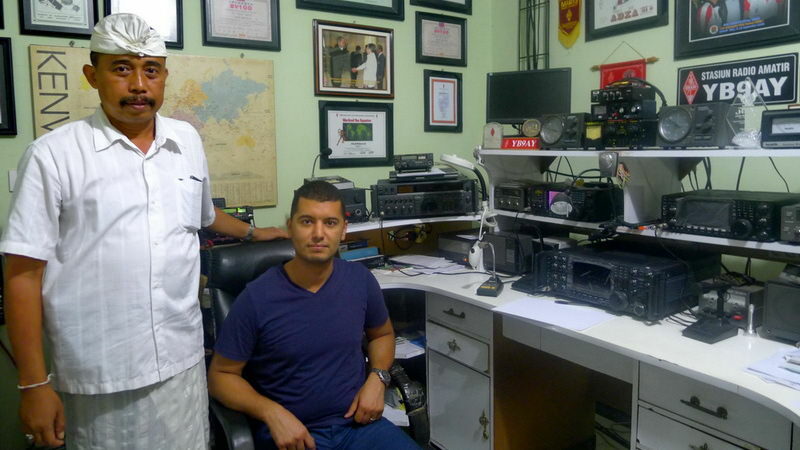 His mission is to see the day when Tunisia issues him that country’s first individual Amateur Radio license. Chaabane will represent Africa as the team leader for the African team in WRTC-2014". KF5EYY Qualified to WRTC 2014! I'm proud to announce that, following the past 3 years of competition and the selection process run by WRTC committee, I will be representing the African Continent in the upcoming WRTC that will be held inshallah from July 8th to 15th 2014 in Boston, USA. I selected Hrane YT1AD to be my team mate in this competition. 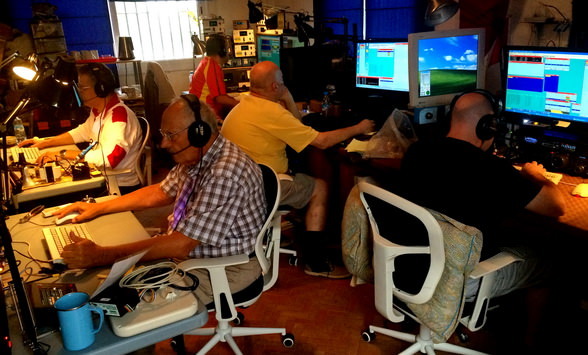 The World Radiosport Team Championship (WRTC) is held every four years and consists of approximately 50 two-person teams of amateur radio operators competing in a test of operating skill. Previous WRTCs have been held in Seattle (1990), San Francisco (1996), Slovenia (2000), Finland (2002), Brazil (2006), and Russia (2010). You can learn more about the history and results of previous WRTC events at www.wrtc.info. WAEDC CW was my first ever attempt using SO2R Technique. An Array Solutions Device was kindly brought by YT1AD. Cabling the device wasn't that difficult and it had solid performance all the contest long. The new technique provided me with extra multipliers and QSO points and I would expect a more extensive use of this technique in the upcoming contests. For more details, please have a look at the contest story. 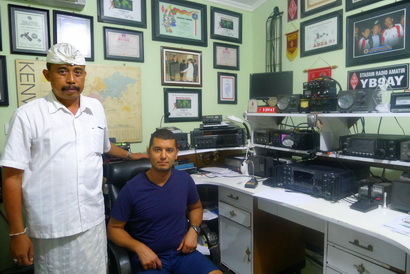 ARAT (Association des Radio Amateurs Tunisiens) has organized a DXPedition to Djeba Island (AF-083) in collaboration with an Italian team led by Fred IK7JWX. The callsign we chose was TS8-Tunisia-Italia. 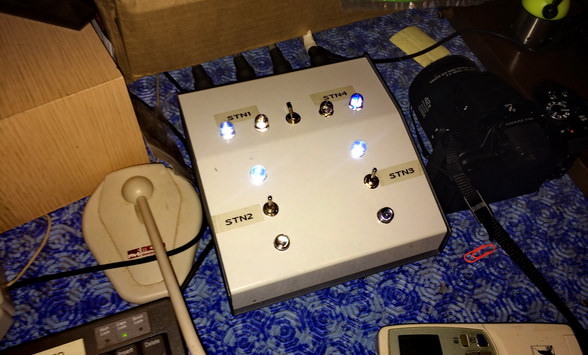 The main goal of the DXPedition was to activate this rare island and give radio amateurs a TS8 prefixe! The DXpedition was also a great opportunity to ARAT members to get in touch with skilled operators which will positively impact their knowledge and operating performance. ARAT role was to organize the activities by aquiring license, logistics, booking, etc. 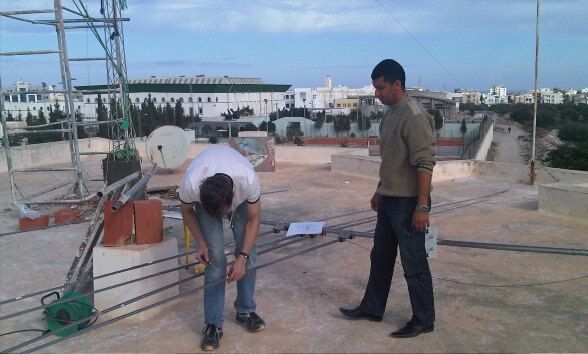 The Italian team was kind and donated a TRX and 3 vertical antennas to ARAT Club 3V8ESG based in the Engineering School of Gabes. I arrived to Djerba island two days before the DXPedition's end. I operated only CW and made over 1000 QSOs in 9 hours. Propagation was excellent and was open towards JA and W/K in the same time with only 100W and a GP antenna right on the beach. CT-37HF Triband Antenna installed in 3V8SS! Many thanks to Andy RA9CKQ for sponsoring the antenna, the tower, PC interface and antenna switcher. And to Al 4L5A for sponsoring the G-800 Rotor. Special thanks goes also to all the scouts and everyone who helped realizing this in such record time! I received today my DXCC award for 102 confirmed DXCCs. All these were confirmed electronically via Logbook of the World LotW (See certificate at left). Thanks to Vitor PY2NY who sponsored all the payments as money transfer from Tunisia to foreign countries is not possible. The next objective will be the 150 Milestone. Paper QSL Cards will be needed to achieve the target as soon as possible. You can find a list of all LotW users by visiting HB9BZA website. At least one week vacation was mandatory for me to rest from a whole year continous work. My request for vacation was accepted and I decided to travel to Turkey. Preparations were very quick and within 2 days I depart to Istambul. Just before I leave Tunisia, I gave a call to Mr.Aziz Sasa TA1E, the president of the Turkish Radio Amateur Club (TRAC). The first three days in Istanbul were dedicated to tourism. Then I had the chance to meet Mr. Aziz several times and other Ham Radio friends there. Mr. Aziz took me to TA2KA and I assisted to an emergency exercice with him where the purpose was to transmit as much emergency messages as possible. 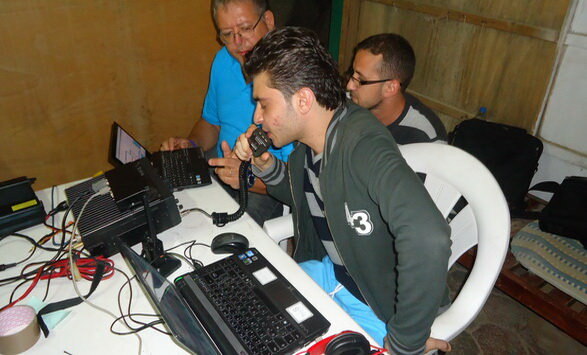 I was surprised seeing how developped the emergency communication system made by Ham Radio in this country. The TRAC has a full support from the government thanks to this. The local authorities sponsored 3 cars to TRAC which transformed it into mobile emergency communications center. I was also able to visit TA1KB Club station. I made a 30-minutes pile up on 20m as TA1/KF5EYY. The pile-up was big and I made around 60 QSOs. My warm thanks goes to Aziz, Mamduh and all the other guys I met for the hospitality and kindness. 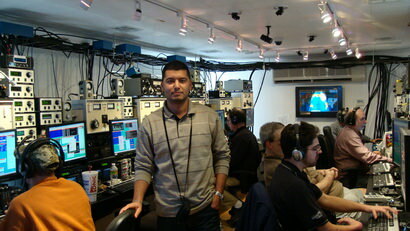 I went to the United States during the month of February 2010 for business. 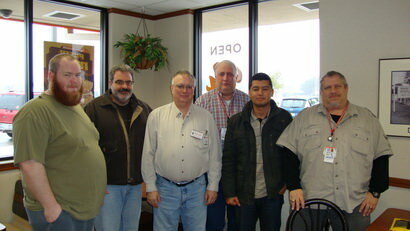 Eric NM5M answered to my call in CQ Reflector seeking for radio amateurs in Texas. We met together, he was so kind and helped me passing the exam for the US License. During the ARRL CW Contest, Eric took me to NR5M Super Station in Hempstead, Houston (about 4 hours driving south of Dallas). We arrived about 3 hours after the start of the contest. 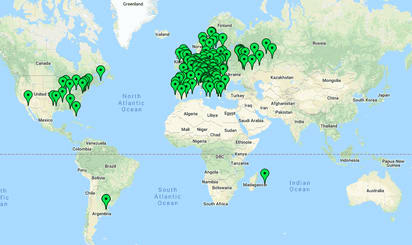 We joined the team and we activated the 10m Stations. I was running the Multiplier Station. Eric was running pile-up. 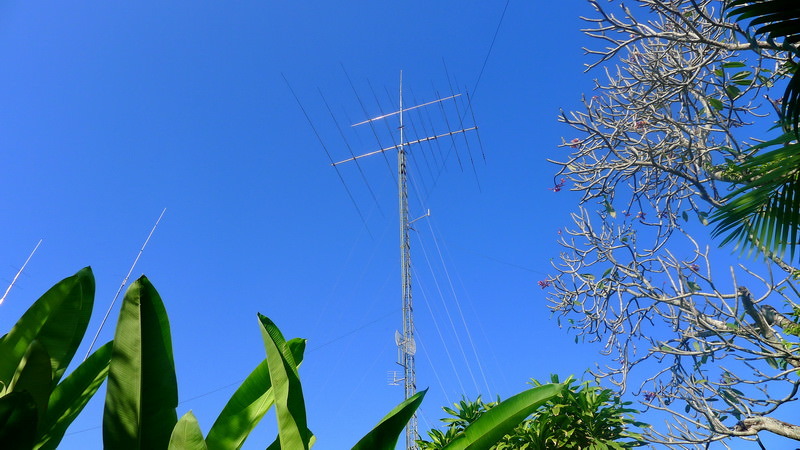 More info about NR5M station here..